In the world we live today, people are always running after all the latest technologies, and LED TVs are one of them. The TVs are getting sleeker and sleeker every day. There are so many innovative and modern technologies included with nowadays amazing, new televisions, and display quality has reached its highest peak. Samsung UN48JU6400 is one of those Ultra HD TVs that is manufactured and designed to provide an amazing visual experience to its users. 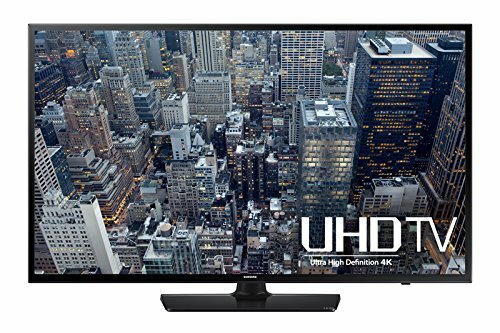 This product is one of the best priced 4K TVs currently available from this manufacturer. However, this does not mean that it lacks in performance or features, since it still has some amazing features to offer such as Smart TV functions, UHD Picture Dimming, HEVC 4K streaming decoding, a contrast enhancer, and a quad core processor. Though the JU6400 boasts 4K UHD resolution, it competes a year or two old 1080p televisions of the same size in price, which is one of its best features. Let’s take a closer look to the TV’s main features, advantages, disadvantages, and some other details so you can decide whether or not this TV is the right one for you. All Samsung’s products are pretty attractive in design, and the Samsung UN48JU6400 is not an exception. Its design attracts the customers with a great look and excellent finishing. You can easily wall mount this model if you are after theater effects, but it is also really easy to place the TV on table top for those who do not like wall mounting. With only 2.5 inches in depth, this TV is ultra sleek, while its 48 inch wider screen provides an amazing experience of videos and movies. For a LED TV, colors pop really well, and it is good to mention that if you are looking for a really bright screen, Samsung is the way to go since it boasts the brightest LEDs in the industry. Another amazing feature of this screen is the ultra clear panel technology that helps in absorbing ambient light. Moreover, this model from Samsung includes a technology for an expanded color pallet called Wide Color Enhancer Plus. Last, this amazing TV is supported by great Motion Rate 120Hz technology that will help to minimize motion blur that is usually noticeable while you’re watching fast action movies or sports. It’s true that in certain condition, some motion blur still might be slightly noticeable, but at least it does not affect the overall image. The light flow through that is created by the Samsung LED backlights is a big plus for the last couple of years, and it continues with the UHD offering. This is one of the best characteristics of the TV. Though some users complain that it might cause some screen uniformity issues, the LED backlight can be toned down from causing screen uniformity issues by turning the backlight setting down to a lower level, the best would probably be around 80%. By doing this, there will be no screen uniformity issues, and you will still have more than enough brightness from this ultra bright LED TV. In case you require it for super bright room, it is always a plus to have a powerful LED backlighting.